Zion Mennonite Church in Hubbard, Oregon on 27 July 1948. Source: Mennonite Community Photograph Collection, The Congregation (HM4-134 Box 1 photo 010.8-7). Zion Mennonite Church (Mennonite Church) is situated on a hill about 4 miles (6.5 km) east of Hubbard, Clackamas County, Oregon. Zion formerly belonged to the Western Amish Mennonite Conference, but after the merging of conferences in 1920 it belonged to the Pacific Coast Conference. It had its beginning as a Sunday school in a dwelling house southeast of Hubbard. On 19 June 1893 the congregation was organized in the Rockhill Methodist Church. In 1894 the present site was chosen and the church building built, which was enlarged in 1910. In 1957 the membership was 295; Edward Z. Yoder was the minister, and C. I. Kropf the bishop. In 1958 John Lederach became the pastor. 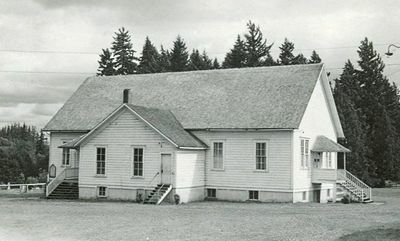 A branch Sunday school conducted by the Zion congregation near Mulino, Oregon, became an independent congregation in 1958. In 2014 the church was served by Minister Mathew Swora and by Associate/Youth Minister Jana Gingerich. Kenagy, Mrs. Edward. "Zion Mennonite Church (Hubbard, Oregon, USA)." Global Anabaptist Mennonite Encyclopedia Online. 1959. Web. 26 Apr 2019. http://gameo.org/index.php?title=Zion_Mennonite_Church_(Hubbard,_Oregon,_USA)&oldid=116740. Kenagy, Mrs. Edward. (1959). Zion Mennonite Church (Hubbard, Oregon, USA). Global Anabaptist Mennonite Encyclopedia Online. Retrieved 26 April 2019, from http://gameo.org/index.php?title=Zion_Mennonite_Church_(Hubbard,_Oregon,_USA)&oldid=116740. Adapted by permission of Herald Press, Harrisonburg, Virginia, from Mennonite Encyclopedia, Vol. 4, p. 1032. All rights reserved. This page was last modified on 27 March 2014, at 01:06.